“The ocean is too beautiful to let die,” is the message of Wonders of the Sea 3D, a visually grand exploration of the deep, aimed at winning children to the cause of ocean environmentalism. The film is part of the legacy of the French underwater explorer and filmmaker, Jacques Cousteau: It follows his son, Jean-Michel, now in his sixties, and two adult grandchildren Celine and Fabien, as they visit some of the most beautiful and imperiled underwater sites around the world. The documentary is co-produced, introduced and intermittently narrated by actor and former California governor, Arnold Schwarzenegger, who brings a Terminator-themed message that we must protect what we love. 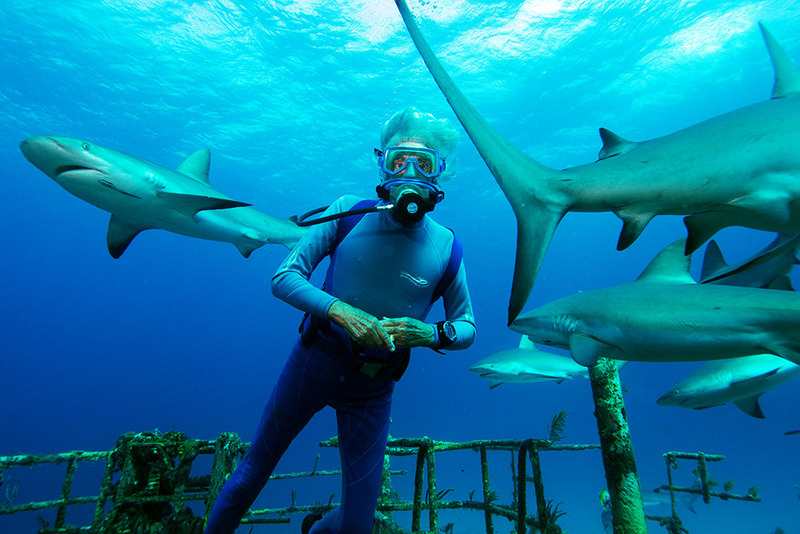 The film's structure is episodic, focusing on four ocean spots -- Fiji, the Sea of Cortez (aka the Gulf of California), a little to the north near Catalina Island, and finally, near the Bahamas -- offering a variety of sea life and addressing critical environmental issues, from the critical role of the multi-form coral reefs to the decline in the world's shark population. Visually, it's a trip, employing macro photography to bring us close to creatures the size of a fingertip and using slow-motion cinematography to capture the grace of underwater movement. The use of 3D here is well-executed, though hardly essential to the appeal. There are multi-coloured coral, stick crabs, blooming anemones, Christmas tree worms, nudibranches (colourful sea slugs), octopi and squid, sea turtles, lion fish, moray eels, hammerhead sharks and a deep sea fireworks display of phosphorescent zoo plancton. One memorable sequence involves a look deep inside the gullet of a grouper, which has claimed a deep seawreck as its home. Noble intentions and technological marvels aside, Wonders of the Sea 3D is burdened with a distractingly cornball script, narrated by the Cousteaus and, occasionally, Schwarzenegger. There's a lot of anthropomorphizing and some painfully stilted attempts at off-camera family banter. There's even a moment when Schwarzenegger awkwardly tosses in an "I'll be back" into a discussion of shark migration. Similarly, Christophe Jacquelin's relentlessly inspirational orchestral score and closing pop song by teen pop singer, Maisy Kay ("Let the heart of the ocean set you free!") suggest this immersive underwater adventure might be best enjoyed wearing a good pair of earplugs. Wonders of the Sea 3D: Directed by Jean-Michel Cousteau , Jean-Jacques Mantello. Written by Jean-Jacques Mantello, Francois Mantello and David Chocron. With Arnold Schwarzenegger, Jean-Michel Cousteau, Celine Cousteau and Fabien Cousteau.